Jonny + Janaye: hello my name is. I work in the public school system of Jefferson County. I am at a different school each night of the week. At each program we ask families to wear name tags just to help everyone out. There's A LOT of people at some of these programs, and my brain just can't handle everything at once. Especially, all those names... I'm really bad at them. If I'm not wearing a name tag, the kiddos are quick to remind me. "Uh, Mrs. Janaye why you don't have your name tag on?" Well I'll tell you what happens folks. 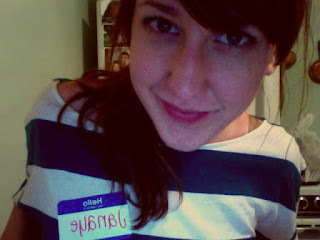 I am convinced by the adorable little ones to make a name tag for myself yet again. A few hours later, the program is over, we all part our ways and I go off the clock and yep, you guessed it, with my name tag on. This has happened too many times now. I've heard things like, "Sweetie, you're walking around with a name tag on" from a stranger at the grocery store. Well, maybe one day I'll catch on. Hello my name is Janaye and I hope you had a wonderful Wednesday!